MONTREAL, Canada—At the deft hands of Shen Yun Performing Arts, a culture with divine origins came to life onstage at Place des Arts in Montreal on April 30. According to New York-based Shen Yun, in ancient times China was known as “Land of the Divine,” meaning the country’s culture and classical arts were bestowed by the heavens. Shen Yun depicts the spiritual essence inherent of the culture in its performances—something that resonated with architect Patrick Malard, who said he felt “lighthearted” after seeing the show. 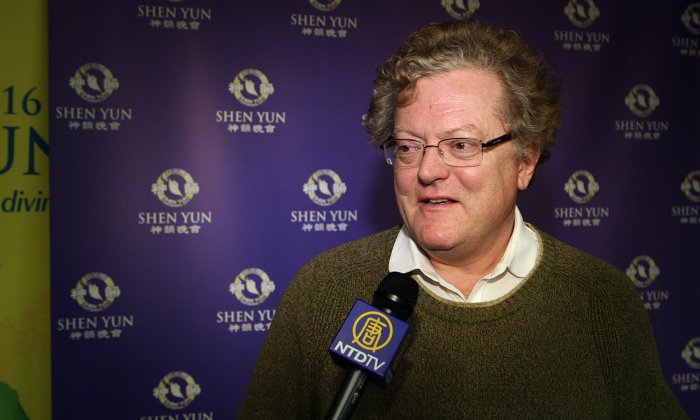 “With [Shen Yun] there is something different. It’s somewhat like a flower. There is something—an opening, a certain spirituality,” he said. Each Shen Yun performance includes at least 20 presentations of classical Chinese music and dance. Many of these are story-based dances, which dramatically portray legendary tales of China’s past and present. Each piece expresses cherished virtues of traditional Chinese culture, and have a timeless message or moral to teach, says the Shen Yun website. “It’s like a window that opens on Chinese culture. It makes one see. At the same time, as we know, there are more than 5,000 years of history, so it’s also fascinating to see that [they] have been able to preserve so many beautiful things from the past,” said Mr. Malard. Pamela Boucher, a personal trainer and naturotherapist, also attended the April 30 show and said she found it very moving. “It made me cry. I found beauty in the movements, and also complexity. It’s something that I’ve never seen, since it’s the first time that I watched this performance. It touched me tremendously. I think it’s something I will never forget,” she said. Ms. Boucher said she had never been touched this deeply by a performance before. Shen Yun performed three shows at Place des Arts, and Geeta Thakur attended the May 1 afternoon show. She was impressed by the divinity and depth of the culture. “I think … that divine connection is really important. It’s true with modern technology today we’re having a disconnect with humanity, so I believe that things like this are important and are very rich. It’s a culturally rich experience,” said Ms. Thakur, a medical science liaison. “Very pleasing to the eye. It’s beautiful. We just love it,” said her mother, Mira Thakur. “It’s unusual, never seen something like this,” said his companion. She said found the performance impressive and exciting, especially noting the themes of fate and hope conveyed in the show. Carole Richard, a manager of clinical studies at a pharmaceutical company, used the word “perfection” to describe the performance. “I find that everything is refined, everything is super perfect, the colour, and then the emergence of culture,” she said after the May 1 matinee.